There’s no doubt about it, middle school is awful for everyone. Students in the midst of puberty, teachers who have to deal with them, parents trying to raise them . . . it’s difficult and problematic in so many ways. However, not everyone has it as hard as the students and teachers at this book’s Greenwich Middle School. Mr. Kermit’s career was derailed early on because of a cheating scandal that wasn’t his fault, and the Self-Contained Special Eighth-Grade Class—known to the rest of the student body as The Unteachables—has been shuffled off to the school’s darkest corner to be, well, out of the way. Kiana Roubini, a transfer student, accidentally finds herself in the mix. Kiana is one of half a dozen students in the class, which includes a boy with a reading disorder, one who can’t control his anger, and others who can’t fit in with more traditional students because of their quirky personalities. Their teacher, Mr. Kermit, used to be good at his job, before the trouble. He began his work life with enthusiasm and a desire to change the world. Mr. Kermit is thrown in with SCS 8 as one final humiliation before early retirement. He is expected to crash and burn, along with the unusual, forgotten students. He plans to ride out the year handing out worksheets and completing crossword puzzles. The students don’t have a problem with that. At least, not at first. Gradually, they get to know each other. The students want more from school, and Mr. Kermit begins to remember what it was like to care. This warm, funny, touching story is told from the perspectives of the many different people involved, each chapter showing another person’s point of view. The students are lovable, and their reasons for their own issues become clear as they narrate their parts of the plot. The love, respect, and care which come to light in the story are real, and it’s easy to root for this group of misfits. This book would be fun for a wide variety of readers, including middle-school students, teachers, and parents. There is much with which to identify, and plenty to learn. 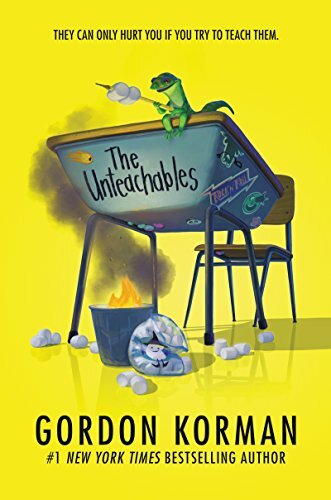 The Unteachables is a lively, feel-good book. Enjoy! Judy Clemens' books in several mystery genres include the Agatha- and Anthony-nominated Stella Crown Mysteries. Her most recent book is Beyond the Grave (Poisoned Pen Press, 2018), the fifth in the Grim Reaper Mystery Series. She also wrote the Agatha- and Anthony-nominated YA thriller Tag, You’re Dead (Poisoned Pen Press, 2016) under the pen name J. C. Lane.